Import multiple images at once without having them appear on the Stage. Drag images onto the Stage from the Library panel. Image filenames remain consistent in the Library panel even if you rename them in the Elements panel. You don’t delete or rename images in the Library panel. You can find the Library panel on the right side of the interface (see the figure). Use the Library panel for Assets, Symbols, and Fonts. Drag and drop from your desktop to the Stage. Import from the main menu. You can use the Library panel to import more than one image at a time. Simply gather all the images you want to use for your project into a single folder; then click the + icon next to Assets. 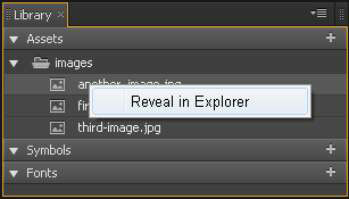 When you do so, you can then navigate your hard drive to find and select images to import into your composition. After you select the images you want to import, they appear in the Library panel (as shown in this figure). Use the Library panel to import images without them appearing on the Stage. 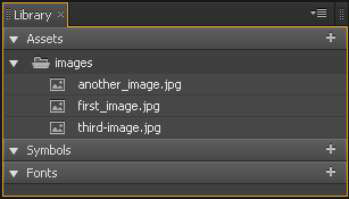 One of the differences between importing images from the Library panel and importing them via the main menu is that the images don’t appear on the Stage and the Timeline. That way, you have your images ready for use, but they don’t litter your Stage. After you have images in the Library panel, you can click and drag them onto the Stage. You can double-click the name of the image to rename it if you so desire. If you right-click an image from the Library panel, you can open the images folder associated with your composition, as shown in this figure. Navigate to the folder from which you imported the image. Believe it or not, you don’t delete nor rename images in the Library panel. Instead, you must use either the Timeline or the Elements panel — and before doing that, you have to add the image to the Stage. You can add an image to the Stage from the Library panel with a click and a drag. When you move an image from the Library panel to the Stage, it becomes an element and — like all elements — it appears in both the Elements panel and the Timeline. Once an image becomes an element, you can rename it and/or delete it, as with any other element. Even if you rename or delete an image element, it remains in the Library panel, but you can rename it or delete it from the Timeline and the Elements panel. To completely remove an image, first remove all instances of the image from the Stage. Then, from the Library panel, choose Reveal in finder. Then you can delete the images from your hard drive.